Teledyne Marine Interconnect Solutions (TMIS) was created in 2013 to align, integrate, and standardize the sales, marketing, business development, and tendering processes of three Teledyne subsea interconnect businesses – Teledyne Impulse, Teledyne DGO, and Teledyne ODI – into a single, high performance, customer-facing organization. The formation of Teledyne Marine Interconnect Solutions introduces a highly capable competitor in the subsea equipment industry, and establishes a powerful new brand in the industry, with a very strong market position and a highly compelling value proposition. 1) Complete access to a broader and deeper range of high performance interconnect capabilities than is currently available today from any other single interconnect company. 2) The ability to order and receive complex, higher-order systems that integrate cross-platform technologies into advanced, value-added solutions. 3) A single point of contact for global customer support activities. 4) Full support of the combined technical, engineering, R&D, service, and productive capabilities found across the Teledyne companies. The combined TMIS organization can deliver to customers the broadest available portfolio of cutting-edge electrical, fiber optic, hybrid, and Ethernet interconnect capabilities that are optimized for use in mission-critical applications where they are required to function flawlessly under any expected operational conditions. Solutions for these harsh environments include wet-mate and dry-mate connectors, pressure boundary penetrators, cable assemblies, and high power systems. Teledyne Marine Interconnect Solutions is a unique competitor in the marine equipment industry. This new organization not only designs, develops, and manufactures a range of high performance, high reliability electrical interconnect systems, it is also backed by the unparalleled scientific and R&D capabilities of Teledyne Scientific, one of the world’s most prominent materials science research institutes. The rich scientific talents and world class laboratories of Teledyne Scientific provides the TMIS organization with unmatched insights into the physical and chemical characterization of materials, and gives TMIS engineers the rigorous scientific knowledge they need to solve difficult mechanical-electrical challenges. No other competitor in the interconnect marketplace can provide its customers equivalent scientific expertise. The three Teledyne businesses that together form Teledyne Marine Interconnect Solutions bring their impressive technology portfolios and outstanding engineering capabilities to the organization. Teledyne Impulse delivers electrical and optical interconnect systems for a broad range of harsh environment applications. The organization’s comprehensive product line of dry-mate, wet-mate, and underwater-mate products contains metal-shell, rubber-molded electrical, fiber optic, Ethernet and hybrid systems. Teledyne Impulse incorporates these products into custom engineered cable assemblies using neoprene, polyethylene and polyurethane over-molding technologies. 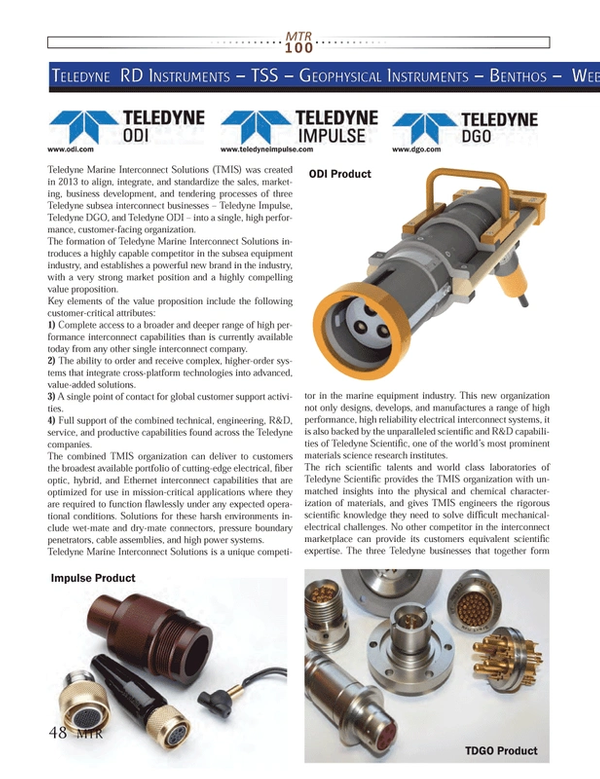 Teledyne DGO specializes in “severe environment” interconnect equipment, and delivers systems which are used to provide power and signals across critical boundaries subjected to extreme pressures and temperatures. Teledyne DGO’s core technology is the glass-to-metal seal, which is superior to all other existing sealing technologies for electrical systems. This dry-mate technology not only demonstrates outstanding resistance to extremely high pressures, it is also made of an inorganic material and thus possesses long-term stability and can withstand conditions that quickly degrade and deteriorate other types of sealing materials.